"What does poison ivy look like?" is more than merely an academic question, since being able to identify the "itchy rash vine" with confidence can prevent you from an unfortunate encounter with it. The scientific name of the plant is Rhus radicans or Toxicodendron radicans. Knowing the old rhyme of "Leaves of three, let it be" is a nice start, but it does not go far enough. These photos will allow you to identify the plant both with and without leaves and at various stages of maturity. While the leaves are the most toxic part of the plant, contact with any part (even when the plant is bare of foliage) can cause an allergic reaction. That is the reason why it is important to learn what poison ivy looks like throughout the growing season and beyond. This leaf close-up shows plants that are less than a foot high but that have already put on their green summer color. Young poison ivy plants often start out in spring with orangey or reddish leaves. Be aware that the margins of the leaves sometimes have notches in them (but not always, so this feature, in and of itself, is not enough to identify the weed). The plants here are just barely off the ground but the oil (urushiol, which is what makes this plant toxic) can still rub off on the fabric of shoes and socks. It is possible to transfer the oil from your clothes to your skin. If you think your clothes have come in contact with poison ivy, be careful removing the garment and wash the area afterward. As summer progresses and poison ivy plants mature, most of the leaves are green, and they are about two feet high. Any new leaves that appear, though, will still be reddish, as in spring (but the red color will not be as intense). Poison ivy vines often grow in a mass, taking over an area and becoming the dominant plant. People seldom associate something as nasty as poison ivy with flowers, but, yes, this weed does bloom. Perhaps ironically, the blossoms are not especially attractive. The flower buds, which form in clusters, look like tiny specks of green if you are just glancing quickly at the plant. Poison Ivy produces rather small, unremarkable blossoms that are off-white in color with orangey centers. Unopened buds that are close to opening are also off-white. You will sometimes see a plant with both opened and unopened flower buds at the same time (as in this example). Walking quickly past a patch of poison ivy plants in bloom, you would hardly notice the individual blossoms. Poison Ivy plants also grow berries, which are just as toxic as the rest of the plant. An identifying trait of poison ivy is the color of its mature berries. When they ripen (in late summer to early fall), they turn from a pale green to a whitish color. Poison sumac also has a curious white berry. The green summer color of poison ivy's foliage yields to brilliant fall foliage in red, yellow, or orange. The autumn brilliance of poison ivy's foliage is due to the anthocyanin pigments characteristic of the plant family to which poison ivy belongs. Poison oak and poison sumac turn similarly colorful shades in fall. All three plants are members of the cashew family (​Anacardiaceae). The color in autumn is as breathtaking as it is on any of the trees grown for their colorful fall foliage. 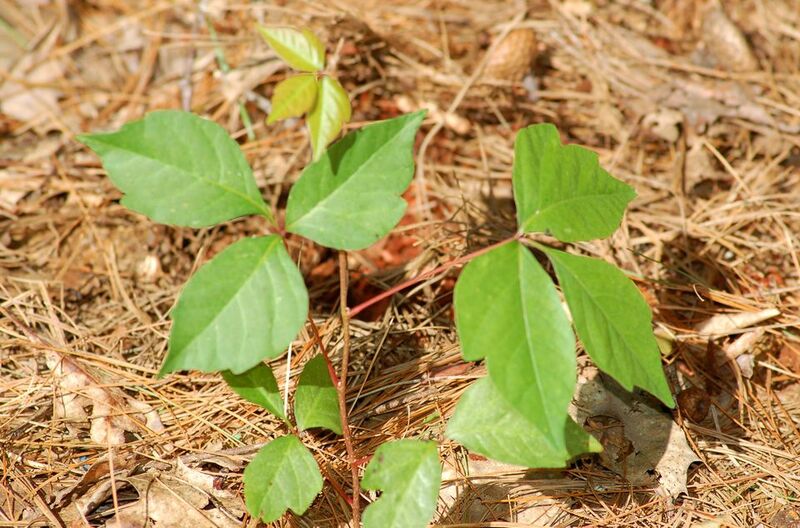 Poison ivy plants tend to come "full circle." If they came out of the ground in spring with red leaves, they often will display a reddish fall foliage. In this regard, poison ivy reminds you of red maple trees. The latter display red buds in spring that hold a hint of what their gorgeous fall foliage will look like. Have you wondered what those hairy vines are that you sometimes see climbing up trees or bristling along the tops of logs resting on the forest floor? That is what poison ivy looks like in winter after the old leaves have fallen off and before spring's new leaves can take their place. The "hairs" are the vines' aerial rootlets. These rootlets can cling to surfaces, allowing the vines to climb. This is why trees, tree stumps, and stone walls are often seen covered in the vines. When poison ivy has been climbing a tree for a long time, the vine can become so embedded into the tree's bark that it largely disappears from sight, with only the rootlets visible. Unfortunately, winter's "hairy" vines are as toxic as the rest of the plant during other seasons of the year. Poison ivy vines can also climb up the walls of buildings. If they are allowed to climb up the side of a house, garage, barn, or outdoor storage shed sided with clapboards, they can wreak havoc with the clapboards over time, necessitating repair work. Are You Sure You Know What Poison Ivy Looks Like? Poison Sumac: Pretty Fall Foliage, but Don't Touch!